SGHS junior Amaya Howell (2) attempts to score over a Federal Hocking block attempt during the Lady Rebels victory over the Lady Lancers on Monday in Gallia County. 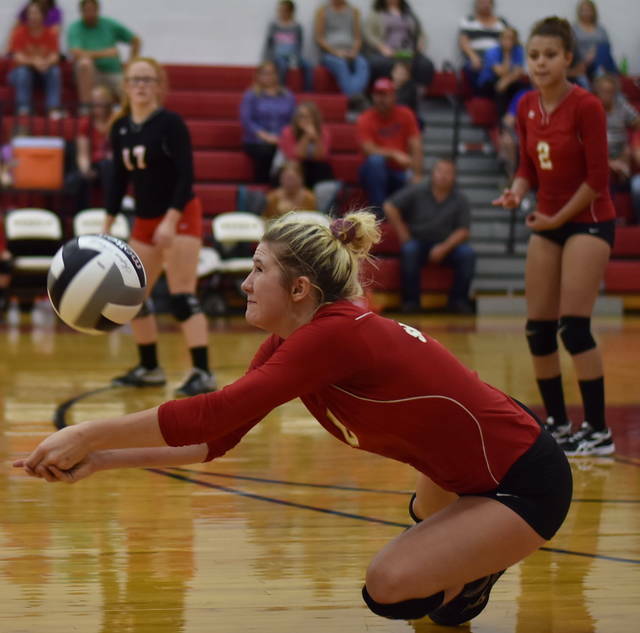 SGHS sophomore Chelsi Siders (5) attempts a dig during the Lady Rebels victory over the Lady Lancers on Monday in Gallia County. MERCERVILLE, Ohio — It’s not always how a team starts, but rather how it finishes. The South Gallia volleyball team trailed 2-0 through the first two sets with the visiting Lady Lancers in Monday night’s Tri Valley Conference Hocking Division match in Gallia County, but the Lady Rebels remained resilient and rallied to take the final three games earning a come from behind 3-2 match victory. The Red and Gold (3-6, 3-3 TVC Hocking) jumped to an early lead in the opening game, as they pulled out to a 5-2 advantage, but Federal Hocking rallied for a 23-to-8 scoring run en route to a 25-13 win. After two ties early in the second game, the Lady Lancers opened up a 9-4 lead. SGHS rallied to knot the game at 16-16, but the visitors manufactured a 9-6 scoring run to take a 25-22 victory. In the third game, the visitors leaped to a 9-3 lead, but the Lady Rebels utilized a 16-10 run to knot the game at 19. South Gallia outscored FHHS the rest of the way to 6-2 to close out the 25-21 win. Federal Hocking jumped to a 15-9 advantage in the fourth set, but the Red and Gold rallied to tie the contest at 17-all. The Lady Rebels controlled the momentum from there, outscoring the visitors 8-to-5 en route to a 25-22 to force a decisive fifth game. 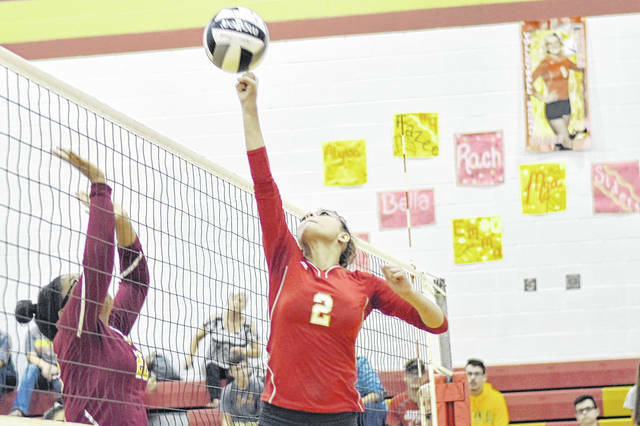 In the deciding game, South Gallia’s Amaya Howell stepped to the serving line — with SGHS already leading the finale by a score of 3-1 — and propelled the Lady Rebels to a 14-1 advantage. The Lady Lancers managed to cut the deficit to 14-2, but SGHS earned the next point to close out a 15-2 win and 3-2 match victory. 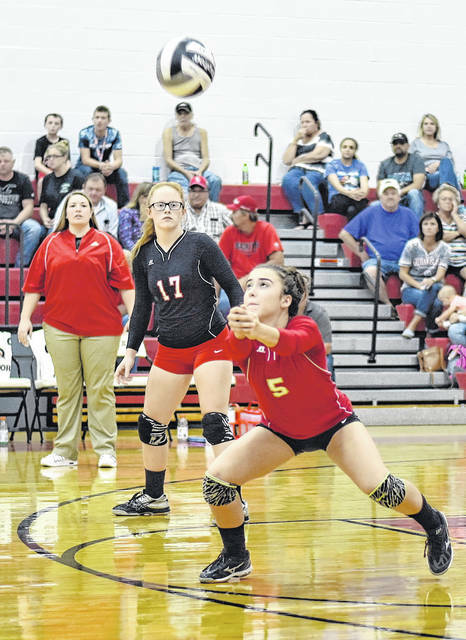 Following the match, South Gallia third-year head coach Sarah Shirley was happy with her team’s performance — particularly with its ability to handle adversity. The Lady Rebels service attack was led by Howell with 17, including six aces, while and Christine Griffith was next with 10 service points, including two aces. Makayla Waugh posted eight points, including one ace, while Emma Shamblin followed with seven service points, including two aces. Rachal Colburn and Faith Poling were next with five points and four points each, respectively, as Isabella Cochran rounded out the SGHS service attack with three points including one ace. Abby Jackson led the way for Federal Hocking with 15 points, while Jaylan Rogers and Linsey Parsons posted eight service points apiece, respectively. As a team the Lady Rebels finished with 21 kills, as Griffith and Colburn led the way with eight kills apiece, respectively. Katie Bowling was next with three kills, while Poling followed with two. SGHS also had 14 blocks in the contest, as Griffith paced the Red and Gold with eight while Colburn was next with six blocks. The hosts also had 11 digs in the game, with Howell and Colburn setting the pace with three digs apiece, respectively, while Cochran and Waugh each finished with two digs. South Gallia finished the match with a serve percentage of 88.6. Makayla Bowen followed with seven points, as Chloe McCune finished with five service points. Mikinzi Ollum was next with four points, while Kendra Tabler rounded out the FHHS service attack with two points. The Lady Rebels will attempt to earn a season sweep over the Lady Lancers when they travel to Stewart on Oct. 8. South Gallia returned to action on Tuesday for a road date with Tri Valley Conference Hocking Division foe Belpre.